Q: When should I repot my orchid? Does it matter when? Timing During which stage of the orchid's annual growth cycle should repotting be done? The next two posts will address these questions separately. 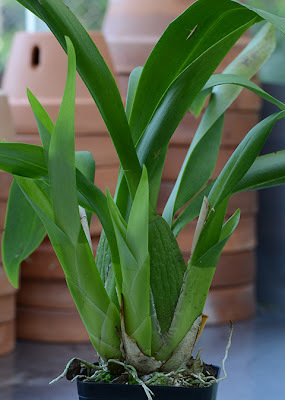 Today's post tackles the first: How often should I repot my orchid? 1. Is the orchid about to overgrow its pot? The Oncidium intergeneric (above) has two new shoots (pointing leftward). They look fine now, right? 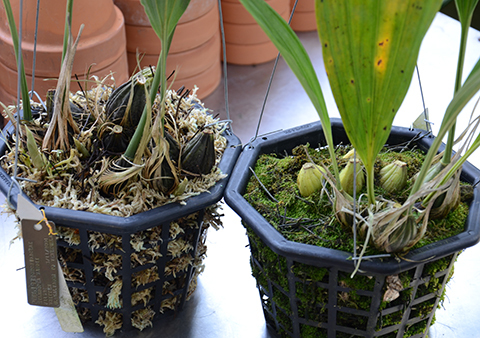 But imagine how they will look next year at this time in the same pot when those two shoots have matured into fat round pseudobulbs. Pretty crowded. Now is the time to repot! 2. 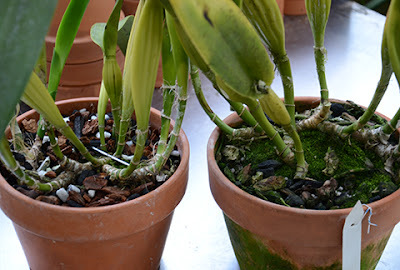 Has the orchid's health declined (shriveled pseudobulbs, wrinkled or yellowing leaves) or has it overgrown the side of the pot? The Laelia (above) should have been repotted two years ago. Yikes. If we wait another year it will be in a serious state of decline. As it is, this plant is so overgrown that it needs not just repotting, but dividing as well--major surgery which could have been prevented had we repotted it in a timely fashion. This plant needs emergency intervention! Cattleya Mix. Brand new (left) and after two years (right). Premium Sphagnum Mix. Brand new (left) and after two years (right). 3. Has the potting mix broken down? Most orchids available commercially are tropical in origin, and the majority of tropical orchids are, in varying degrees, epiphytic--they live in trees. Their roots are often exposed to brief drenching rainfall, wind and drought on a daily basis. They are not covered in wet soil. 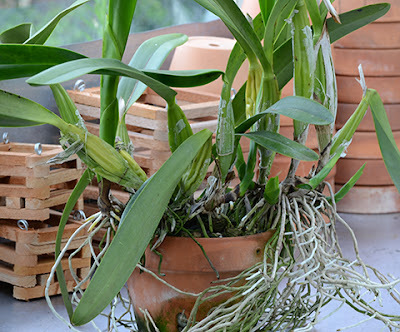 In cultivation orchid roots need a potting mix that allows some air circulation. That's why the best orchid mixes are chunky and coarse in texture. 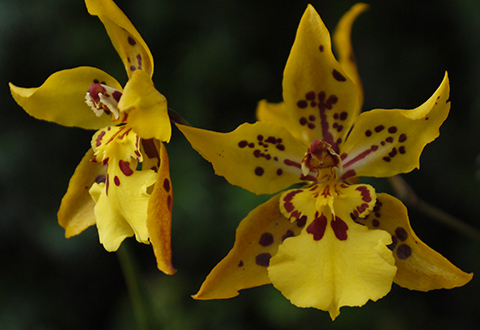 A high quality orchid mix--either the classic bark/charcoal/perlite type or the newer premium sphagnum variety--lasts about two years, depending how much warmth and moisture it is subjected to. Over time bark and sphagnum break down, and if watered at the same rate they become increasingly waterlogged. Ask yourself: Does the mix take a lot longer to dry out than it used to? Is the moss now dark brown or covered with green moss? Is the bark soft and crumbly and dark brown? Time to replace it! A constantly saturated potting mix will kill your orchid. The bottom line: repot your orchid about every two years. A 'yes' answer to any of the 3 questions above means that your plant is a good candidate for repotting. But maybe not immediately! In order to time your repotting correctly, see my next post.